Here is our list of some pretty cool Trimarans. Picture this: Sailing on a Trimaran, the boat is smooth and steady. You are skimming across the water in a boat with three hulls with the wind rushing past your face. That’s the kind of a feeling you get when you are in a Trimaran. Originally, I wanted to to try one out just because it looked like so much fun. Then I realized it would be perfect for my wife, who loves to sail fast, but hates rail in the water or flying a hull. That’s when I realized this type of boat was made for her. 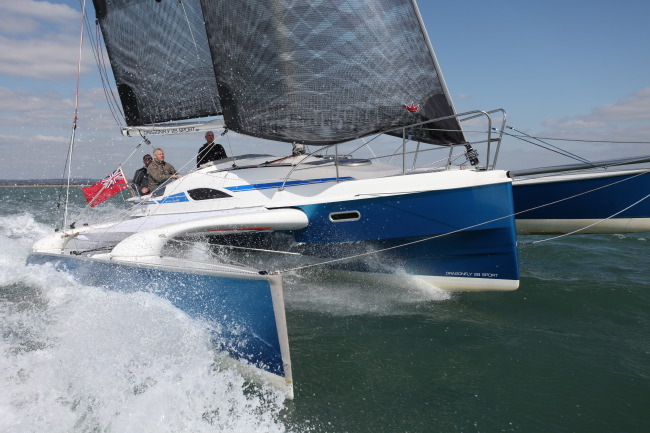 Here are some Trimarans that we really like and we want to try out. Just as a note; We are not affiliated in any way with any of these companies, we just think they are cool. Of course we have to start off our list with what could be considered the most well-known trimaran, the Corsair. It’s pretty, really pretty. Plus she glides like a dream while cutting through the waves at fairly high speeds. If you really want to know what’s great about a Corsair, read their 16 reasons for buying a Corsair. What we like the most about them is that they are trailer-able. Yes, these boats are easy to move not only on water, but on land as well, making them very accessible. They are also very safe, and can handle more people both above deck and below. Of course we like to give them brownie points for being originally started in San Diego, like we are. There aren’t too many downsides to any in the Corsair fleet, except the fact that it may cost you a pretty penny to have all of these features. Is it worth the money? We think so. We are proud of the new Dragonfly 28, which sets new standards for the possibilities of a sailing boat. The perfect boat does not exist – but the Dragonfly 28 is very close to this ideal. The Dragonfly 28 is a brand new concept line in the Dragonfly range. The boat sets new standards for leisure and flexibility on the water and on wheels. The Dragonfly 28 has been a lifelong dream of Jens Quorning, who designed and developed this complex boat with his co-designer Steen Olsen. The development took almost 2 years – now the boat is a reality. This boat is the ultimate combination of design and function. This is a 28′ foldable and trailable trimaran, which means that you have all the benefits and features from a trimaran on the water -allowing speeds up to 20+ knots, shallow draft of only 0.4 m and super comfort while sailing, as the boat is hardly heeling. The boat offers five full size comfortable berths of each 2 m, a nice main cabin with excellent view and a very big cockpit for the whole family. On the trailer you can average 45 knots – launch and rig the boat yourself with a set-up time of 30 to 40 minutes. THE ONLY SAILING KAYAK DESIGNED FROM THE GROUND UP FOR OPTIMAL PERFORMANCE, EASE OF TRANSPORT AND AFFORDABILITY. You can expect nothing but the best from the TRIAK. 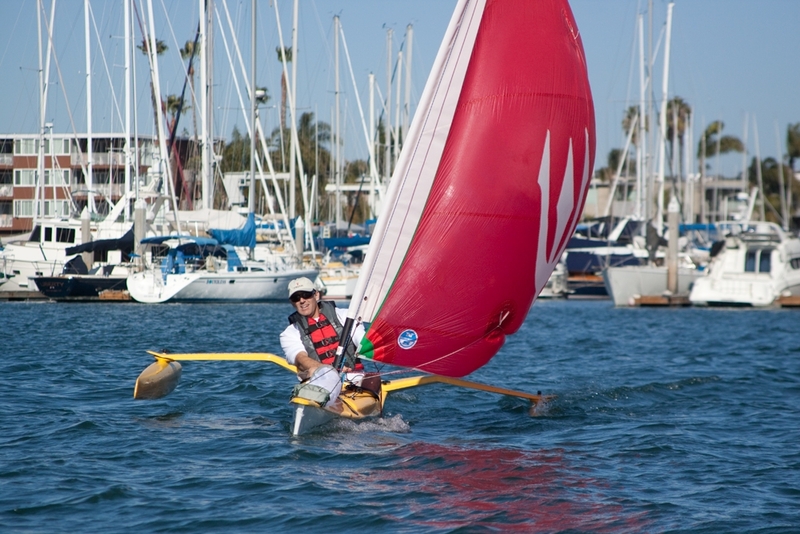 The boat is fast, loads of fun, and the most versatile trimaran sailing kayak on the market. The TRIAK is not a kayak retrofitted with floats and a sail, but instead is designed from the ground up for equal sailing performance and smooth, fast paddling. TRIAK is Expedition Tough with a Yacht Club finish built using top quality fiberglass construction. TRIAK is the only boat of its kind with America’s Cup Pedigree co-designed by the World’s top multihull yacht designers, Morrelli & Melvin. Huge value and affordability from a TRIAK package that includes North Sails, a Ritchie Compass, and Harken Hardware for $4,999. You don’t even need an expensive trailer! Watch our own Triak Intro video here. With fibreglass hulls and carbon fibre spars and beams, the Weta is stiff and fast, the boat will easily reach speeds of 15 knots. The Weta can be rigged in less than 20 minutes with only 5 lines to control all 3 sails. The mast is so light that even kids can rig the Weta and launch it effortlessly from the specially-designed beach trailer. 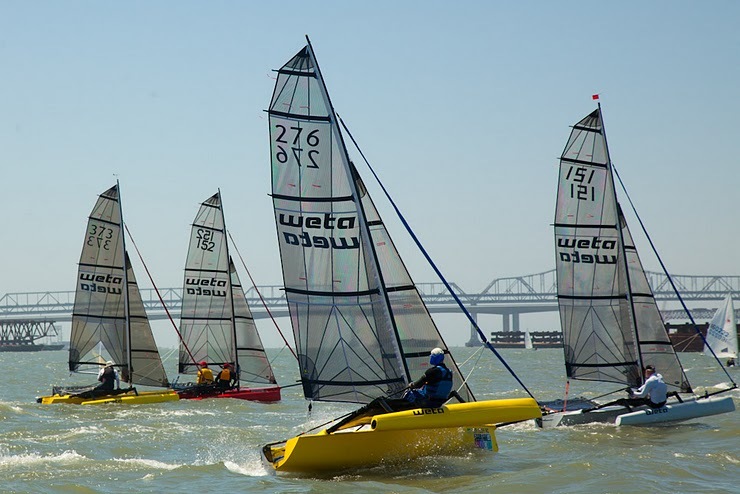 Well balanced and easy to helm on all points of sailing, the Weta is a great boat to learn to sail with no boom to hit your head. The Weta has an open cockpit that is safe and secure for kids learning to sail. Sit with your feet in the cockpit and sail for hours on end in comfort, great for anyone less mobile. 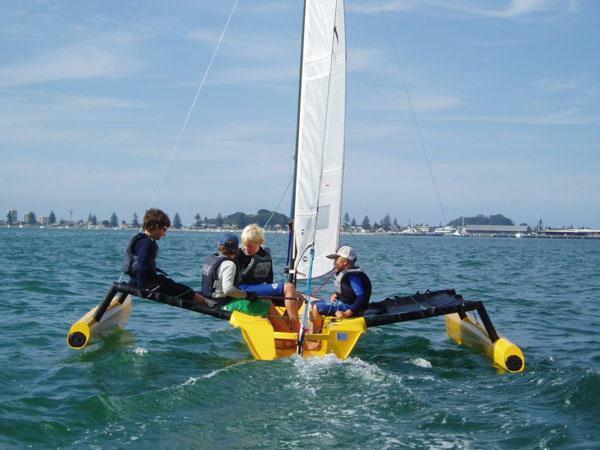 Being a trimaran the Weta is very stable with little risk of capsize. Sail the Weta single-handed or in any combination of kids, teens and adults – the Weta accommodates up to three adults easily. Use various main, jib and screecher sail options to suit yourself and the conditions. The Weta is a very exciting, versatile recreational yacht. Sail the Weta like a skiff, fully powered upwind then take the jib off and let the kids have a blast. At 1.7m wide on the beach trolley the Weta will fit in any garage with ease. In less than 2 minutes transform it into a 3.5m wide beast that will be the envy of all sailors.